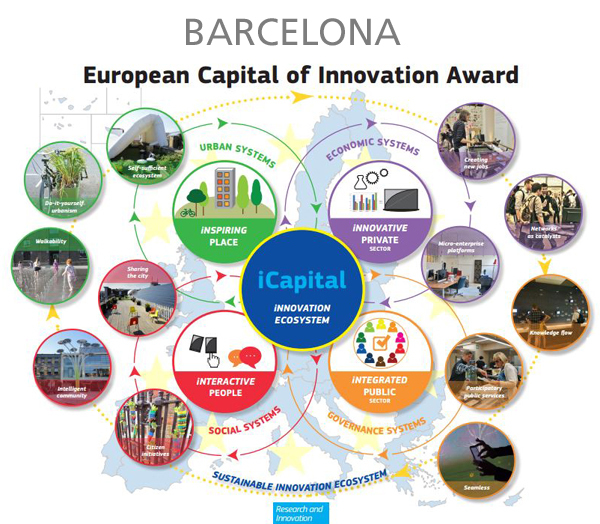 The European Commission, through a panel of independent experts, has awarded the prize to the European Capital of Innovation ( iCapital ) to Barcelona in the closing ceremony of the Innovation Convention 2014. Thus, Barcelona, together with its already excellent international reputation in design, gets this recognition of innovation especially by a culture that leads to innovation not only in technology products and goods, but new designs specially adapted for people focus on sustainability, energy efficiency and social innovation. An innovation that attracts talent, inspires others and engages individuals and businesses in a culture that favors progress and an ecosystem of generating new ideas and concepts. In GESAB are partakers of this culture of innovation, and our headquarters in Barcelona ? ?we designed and run all our products through the synergies generated within the group, where everyone, from Madrid, Barcelona to Mexico and thanks to internal communication systemsimplanted in the business, bringing new creative solutions that are implemented to enhance the satisfaction of our clientes. The innovation is part of the DNA of the company and is a differentiator factor that allows us to be more competitive. This innovation is not only developed in one isolated department, but are all the people in the organization who contribute with new ideas in a daily basis. It is to generate innovation in a usual manner and as part of the routine of daily work. Every day we look for new ways of doing things, to challenge the “status quo” to move forward. People are, therefore, key to the GESAB´s innovation process. Forums and creativity are stimulated with a high tolerance to take risks and manage failure, all as part of the experimentation process. In short, a culture of innovation based on motivation, participation, talent of all people who are part of GESAB and a climate of confidence that leads to a commitment to provide our solutions on Decision and Control Centers, Audiovisual Solutions and Data Processing Centers, maximum adaptability to meet the specific needs of each of our clients. The announcement of the European Commission awarding this prestigious prize for innovation to Barcelona ? ?motivates us to follow a path where technology, design, innovation and people come together for a better world.